of biofuels at filling stations is available to download and should be used alongside this publication. 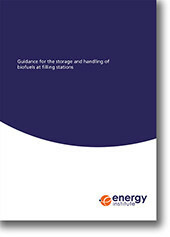 This publication updates the Guidance for the storage and dispensing of E5 petrol and B5 diesel at filling stations published in April 2008. The update reflects experience in the UK following the initial introduction of biofuels to the market and changes to EN 228 Automotive fuels – Unleaded petrol – Requirements and test methods, and EN 590 Automotive fuels – Diesel – Requirements and test methods, with regard to the permitted composition of petrol and diesel fuels respectively allowing up to 10 % ethanol in petrol and 7 % fatty acid methylester (FAME) in diesel. This publication provides guidance for filling station operators on the introduction of E5, E10 and B7 to meet requirements of EN 228 and EN 590 respectively. Although it is the expectation that the biofuels will be stored and dispensed using existing equipment, there are certain items that require attention particularly during the initial introduction of these blends or changing from one blend to another; this publication focuses on these issues. The actions identified in this publication are aimed at minimising the risk of adverse impact on existing filling station equipment/systems, operations and the environment resulting from the introduction of biofuels. Whilst written to be applicable specifically in the UK, the principles may also be applicable in other countries implementing E5, E10 and B7 blends, providing national and local statutory requirements are complied with.